What are the factors driving India’s astounding e-commerce growth in the next two decades? E-commerce in India has been experiencing remarkable growth, successfully changing the way people transact. The online market space in the country is burgeoning in terms of offerings ranging from travel, movies, hotel reservations and books to the likes of matrimonial services, electronic gadgets, fashion accessories and even groceries. Eyeing this e-retail opportunity across multiple segments, investors have been aggressively funding the e-commerce sector. We live in a world where we communicate with each other over mobile phones than we do face to face. For keeping in touch, shopping, hailing a cab, or ordering food… everything begins and ends with that smartphone. This growth has been fueled by rapid adoption of technology, improving standards of living, an increasing young population, and economically advancing middle class, besides increasing access to the Internet through broadband and use of smartphones and tablets. E-retailers use web interferences to differentiate themselves from their competitors. However, though this Indian online market is growing at an exponential rate, but what is the pattern of consumer psyche behind online shopping. An article on ‘Effects of Online Shopping Values and Website Cues on Purchase Behaviour’ from the journal Vikalpa applies the concept of the stimulus–organism–response to explain Indian buyers’ online shopping behaviour, besides examining the importance of design elements in enabling website satisfaction (WS). Using a survey method to test the research model, primary data were collected from five Indian metropolitan cities of Delhi, Mumbai, Kolkata, Bengaluru, and Hyderabad during the months of May and June 2015. Findings of the article suggest that both internal and external elements have direct influence on WS. As the mediating variable, WS affects purchase intention. This research highlights on why and how ‘satisfaction with website’ matters in the contribution of shopping values and website atmospherics to behavioural outcomes by presenting its mediating role. Register now to read full survey. Are stronger IPRs enhancing or retarding industrial development in developing countries? Asia is now well recognized and acclaimed as a growth pole of the global economy. The dynamism of Asian transition is based on building innovative capabilities and modernizing the national innovation system. Asia has allocated higher resources to research and development (R&D) during last three decades. In terms of R&D expenditure, the Asian region has incurred the highest proportion, that is, 42.2 per cent, of the global economy and ranked as number one (UIS, 2015). The gap in terms of R&D intensity between Asia and Europe and North America has reduced during 1991–2013 (UNESCO, 2015). However, in terms of output indicators, the Asian region is lagging behind. This lag in investment in innovation activities and output indicators is understandable. But the pace of catch-up of Asia is remarkable (Lee, 2013), which is shown from the increasing importance of intellectual property rights in the development processes of these economies. Factors that promote innovation is a key issue for economic and industrial development in the Asian countries. A variety of social and economic mechanisms, including the strength of intellectual property rights (IPRs), the international harmonization of IPRs, the science and technology policy conducted by governments at several levels and in categories to support firm’s innovative activities, and the competition and collaboration among firms and universities, are expected to positively affect the innovative activities. 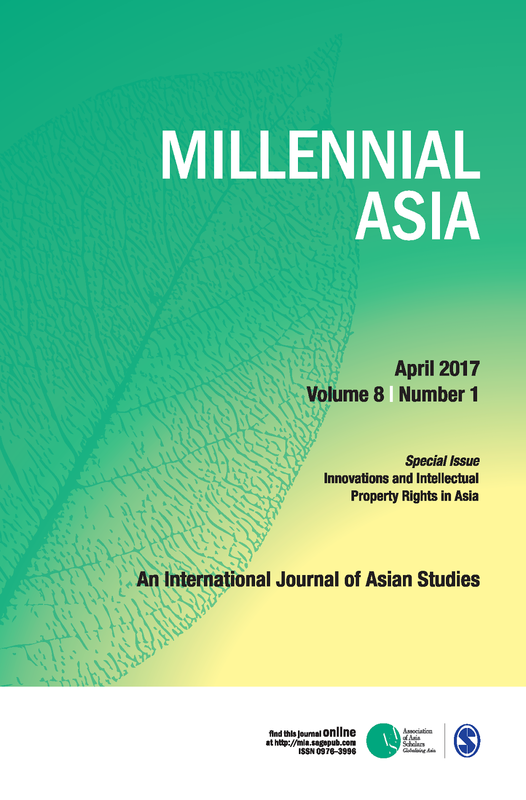 Recent Issue on “Innovations and Intellectual Property Rights in Asia” from the journal, Millennial Asia, examines the relation between IPR and economic and industrial development. There are two different views on whether the stronger IPRs enhance or retard industrial development in developing countries. Policymakers in developing countries sometimes assert that the success of high-tech industries in developing countries is a confirmation of the view that keeping IPR systems weak at certain stages of economic development can function as an infant industry policy, stimulating the growth of technologically dynamic indigenous firms. On the other hand, empirical evidence by many economists suggests that stronger IPR systems accelerate industrial development. The issue presents papers which examine whether delaying the embrace of strong IP has led to dynamic growth and whether the emergence of innovative strength or the stronger IPR systems accelerate industrial development.